While the rest of the world tiptoes back to financial growth, China is surging full speed ahead, with a government pouring money into stimulus projects and a populace splurging on luxury goods. For proof, one can look to the galloping advance of the luxury hotel sector. “With the incredible growth in affluence among the domestic population, the need for hotels in China is rising dramatically,” says Daniel Ford, a Ritz-Carlton publicist. The Four Seasons group is planning to open 14 hotels in the country by 2014; a dozen have already launched since 2008. The new Ritz-Carlton Hong Kong, billed as the tallest hotel in the world and opening in March, will boost its parent company’s China total to eight, and at least one more is on the way. And taking into account all its brands, Starwood had 50 hotels in the country by 2009 – and is set to open 97 more by 2015. Plus, these won’t just be any hotels: “Many of the finest luxury hotels in the world will open in China in the next several years,” says Bruce Ford, senior vice president at Lodging Econometrics. Interestingly enough, many of the high-profile hotels are opening in cities that many Westerners haven’t heard of – yet. Scoot over, Shanghai. Here’s a quick guide to six cities on the rise. Guangzhou The capital city of the Guangdong province abutting Hong Kong and Macau, Guangzhou is a gateway for many travelers entering China. Delta offers nonstop flights from Los Angeles with partner China Southern Airlines. 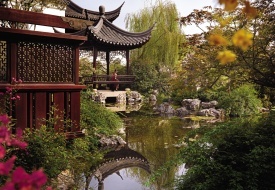 Historic sites abound, ranging from Buddhist and Taoist temples to China’s first mosque. The city is considered the birthplace of dim sum. Sanya This city in Hawaii-like Hainan has emerged as a destination only in the last 15 years. But with a year-round average temperature of 77 degrees and 300 days of sunshine, Sanya is rapidly attracting resort lovers. Sanya has stellar beaches and some of China’s best golf courses like the Yalong Bay Golf Club. Hangzhou When Marco Polo visited Hangzhou in the 13th century, he declared it to be the most beautiful city in the world – a statement that doesn’t seem far-fetched today. Visitors flock to the stunning West Lake, set amid lush hillsides, which has inspired Chinese poets and artists for centuries. Chongqing The major embarkation point for Yangtze River cruises, Chongqing’s history stretches back 3,000 years. The Dazu stone carvings, thousands of Buddhist figures dating from 650 AD, are a must-see. A 2-hour flight from Beijing, the city is also notable for its diverse blend of Chinese cultures. Tianjin About a 2-hour drive from Beijing, or 30 minutes by bullet train, Tianjin is the main cruise hub for the Chinese capital. In Tianjin itself, day cruises on the Haihe River are a popular pastime, as is surveying the eclectic architecture influenced by Britain, France, the United States, and other foreign powers. Qingdao Even if you’ve never heard of Qingdao, you’ve likely tasted its Tsingtao beer. This coastal city was once a German concession, and its red-tiled roofs recall Munich. Sailing is popular – the city hosted the 2008 Olympic Sailing Regatta – along with parasailing and windsurfing, thanks to mild weather. For general trip-planning information, see our China Travel Guide.